Proceed at your own risk! The information here is accurate to the best of my knowledge. I will not be held responsible if this document causes your computer to explode or burst into flames. In real serious terms, if any corruption of data, hardware damage or any other kind of damage/losses/etc. arises from the use of this document, I will not be responsible for it. If you don't like this, please don't read any further. This is the Number 1 culprit in slowing down your browser. To get an idea of the speed boost you can get, go to Start > Programs > Accessories > System Tools > Internet Explorer (No Add-ons). How Much Speed Are We Talking? You will now see Internet Explorer start without any add-ons or toolbars. The speed of how the browser starts now may have startled you. Try out the browser now. Very much faster? Now you realize how those pesky add-ons have been slowing down your browsing experience. However, in this mode, you won't be able to watch YouTube videos as the Flash add-on is also disabled. We will fix this now. 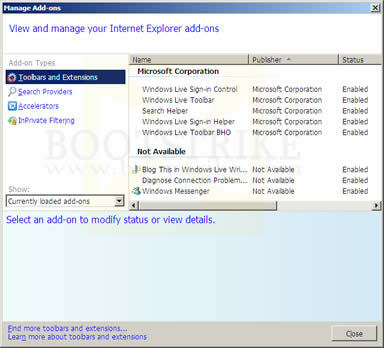 - For IE8 and IE6, go to Internet Explorer > Tools > Manage Add-Ons. This is how Manage Add-ons looks like in IE8. The difference between earlier versions is that they have some additional functionality missing, but the main functions we need are there. Now you have a list of add-ons that are currently loaded. What you need to do now is to disable all add-ons that you don't need. So now you ask, how to disable an add-on? For IE8, click the add-on on the right column, and click the Disable button at the bottom. For IE6 and IE7, click the add-on and at the Settings box at the bottom, click Disable. Here is a table of some commonly known add-ons that you can disable. The value in square brackets [ ] indicate my personal opinion of whether it should be disabled. Almost all of the add-ons can be disabled as they are not used. Some PCs have this set for some reason, slowing down every time you open the browser. If you in a work environment, do not use this tweak as it may cause your Internet not to work. To disable this, go to Start > Control Panel > Internet Options > Connections > LAN Settings. Uncheck all the boxes under Automatic Configuration. Internet Explorer 7 and below are limited to two connections per server. This is why you can only download a maximum of two files from one website. Internet Explorer 8 raises this limit to 6. Here is how to increase the number of HTTP simultaneous connections to 10. By having 10 connections, IE will be able to download 10 different files at one time. This will make web pages load faster. A box should appear. Put the name as "MaxConnectionsPer1_0Server", without double quotes. Press Enter. A box should appear. Put the name as "MaxConnectionsPerServer", without double quotes. Press Enter. A box should appear. Put the name as "iexplore.exe", without double quotes. Press Enter. Firefox has AdBlock Plus. Internet Explorer? HOSTS file. Unfortunately, the Hosts file method is not as straight forward as Adblock Plus. For one, it blocks websites at a domain level. Next, removing an entry from the file requires you to go through some technical steps. But once you get it working, you realize the speed benefits. Sites load faster. Here's how to install HostsMan, a free software that helps to manage the HOSTS file. Under "Download (Installer version)" header, click a download link under "Download from:"
On the box that appears, click Update. If HostsMan asks whether to update the Hosts file, click Update. Once you are done, you can close HostsMan. HostsMan does not need to be running. The table at the top of the window will be highlighted with the matching row. See what I mean when I said removing an entry is not easy? Now when you visit a blocked site directly, the message "Blocked: (domain name)" will be shown instead. Page loading times will now have a significant improvement. Windows XP SP2 and above limits the number of half-open connections to 10. This is not a big issue, and increasing the limit yields little benefits. Right-click the link and click "Save Target As". To reset the max half open connections, run the lvllord utility again (for XP) and type 'U' to uninstall. To disable ActiveX, set 'Run ActiveX Controls and plug-ins' at the same window to 'Disable'. This automatically disables Flash as well. It has been widely speculated in the web that running the following 'tweak' improves IE8 speed considerably. In actual fact, what it does is fix some holes left by installation processes. and press Enter. You should get a 'DllRegisterServer in actxprxy.dll succeeded' message. Few people remember to do this. Eventually, the hard drive ends up with years of data that was downloaded from the Internet. Depending on the amount of data, this process can take some time. Defragging can improve performance in many software programs, not only Internet Explorer. It is best done after cleaning up your hard drive with a free utility such as CCleaner which we will do below. First, lets do a clean up of your hard drive to get rid of all temporary files using a free efficient program named CCleaner. By default, CCleaner erases Internet Explorer History and Cookies as well. If you don't want to delete these, uncheck the relevant boxes in the left column under Internet Explorer. Click OK. Don't worry, only temporary files are deleted. CCleaner will now run and delete all the left over temporary files. You may see stuff like Recent documents shortcuts and IE URL drop down empty. This is normal. This will take some time depending on how badly fragmented the drive is. For best results, close all programs before clicking the Defragment button. Some security software (such as Spybot - source) insert large lists of site addresses in Internet Explorer's Restricted Sites feature. This can slow down IE as it will need to verify the access permissions for every site it pulls data from. WARNING: Following the tip below will clear all malicious site addresses inserted by your security software. With such entries, IE will restrict on what such sites can do IF you visit them. Without these entries, IE will treat these sites as normal sites. This does not mean that your computer is now more open to security vulnerabilities. As long as you keep Windows and Internet Explorer updated, you reduce the chances of getting compromised.. Personally, we would remove such lists as they can slow down the Internet Explorer browsing experience. First, download and extract the files to any folder. This would have optimized your settings according to your internet connection you have. If you need to undo the changes TCP Optimizer made, open TCP Optimizer > File > Restore Backup Settings. Errors? Omissions? Need Help? Know something? Post your queries in the comments below! This document is Copyright(©) 2010 by G.Ganesh. Visit Bootstrike.Com (http://bootstrike.com). Unregistered #7. Re-register actxprxy.dll (IE8 only) really worked wonders on my surfing speed. Spybot slowed down IE8 in my computer, and this made my browser three times faster. Unregistered Superbly helpful, very well considered and constructed - many people in many industries would do well to follow ! A sincere and personal thank you. Franksr (1 posts) I just installed WIN 7 Pro on a new hard drive. I went through all your suggestions and it didn't help with my problem. However, if I run "iexplorer -exoff" it runs like a champ. I'm guessing it has to be one of the IE 8 Add-ons. This is very frustrating. I bring up any web site or click on a link to one, and 15-20 seconds before it comes up and sometimes longer. Its not my ISP connetion as it's 12MBs and last time I ran it it was over 25MBs download speed. I've been installing software and I'm thinking this Adobe Creative Suite 5 Web Premium might be part of my problem. Thanks for such a detailed list of suggestions. I appreciate all the effort you have put into this article. I knew of the steps in section 3, but as for the rest.....I had no idea.